Updated 14 April 2019- Click the Picture to see what's new! Face it. You can page through the Aerocrafter Guide , or pick your way through the KITPLANES December issue, and find a lot of homebuilts that are faster, sleeker, and newer than the Fly Baby. Why not build one of them, instead of a 40-year-old-design? The answer lies in your own flying habits. Why do you want an airplane? Will you be making regular trips for long distances? Carrying passengers? Blasting up to high altitudes? Or are you just looking for a fun, knockaround airplane? Something that doesn't cost much to own? Something that you can go sightseeing in without breaking the bank on fuel costs. Something more substantial than an ultralight or ultralight-based design. Take an honest look at the way you fly an airplane now. Do you just make "Hundred Dollar Hamburger" runs on the weekends? Do you fly just for the joy of flight? Do you generally go by yourself? Then maybe...MAYBE...a Fly Baby might be the plane for you. They're cheap as dirt to operate. Our EAA Chapter operated Pete Bowers' prototype as a club airplane from 1987 to 1994. Rarely did our yearly maintenance bill exceed $100. That's not a typo... One Hundred Dollars. Even today, my airplane costs me, generally, less than $500 a year in maintenance. Including hiring an A&P for the yearly condition inspection. The major drawback: Fly Babies don't come in kits. You carve every piece of wood; bend every bit of metal. Yet the Fly Baby is designed to be as simple as possible to build. EAA Judges rate aircraft at Fly-Ins, not only on how well the builder did, but on how difficult the airplane was to build. The Fly Baby has ALWAYS occupied the "easiest" category...even in today's modern kit era. They go together like a big balsa-wood model. You don't even have to build-up ribs like most wood homebuilts. Instead, you stack up sheets of plywood and "gang-saw" them all at once on a bandsaw. By not buying a kit, you save tons of money. Even today, one can probably build a Fly Baby (less engine) for $6,000 or less. Even though it doesn't come as a kit, a lot of the major parts (fuel tanks, engine mounts) come from the J-3 Cub, and companies like Wag-Aero and Univair still sell these parts. It's not "Tab A into Slot B" kitbuilding. But the Fly Baby was the seminal EAA project; it was the first (and so far, only) design ever to win an EAA design competition. EAA essentially cut its teeth on Fly Babies. If you need help building one, assistance is as close as your nearest EAA Technical Counselor. The Fly Baby is a single-seat, open cockpit, folding-wing monoplane powered by engines ranging from 65 to 100 HP. It was originally designed in 1960 to compete in the first (and so far, only EAA design competition). It is built primarily of wood, with fabric covering. Most are powered by Continental A-65, C-75, C-85, or O-200 engines. Performance is sprightly; a bit better than that of, say, an Aeronca Champ. While a single-seat airplane, the Fly Baby isn't small. It has a wingspan just two feet less than a Cessna 150. It's got a big cockpit. Pete Bowers is six feet two inches tall, and I weigh about 250 pounds. That gives you an idea of the range of sizes that can be accommodated. The Fly Baby can be built as a biplane as well as a monoplane. The two monoplane wing panels are replaced by four smaller ones, plus a center section for the top wing. The aircraft can be switched back and forth between versions in about an hour, but it does take a helper. The biplane, while cool in concept, doesn't really offer too much. It's slower, and the wings don't fold. Still, its swept-back upper wings make it look a bit like a Bucker or Tiger Moth in the air, so if you'd really rather have a biplane, the Fly Baby would do the trick. The monoplane/biplane issue is more than a wing swap...there are some internal braces and external tangs that have to be added to the fuselage. You can do this once the fuselage is done (The prototype was converted after completion), but it is, of course, easier during construction. Switching back and forth between the wings takes two people about an hour. This assumes the rigging has already been set. While I helped on a wing swap, I never flew the biplane version. Other than appearances, there isn't much advantage. It's slower, and glides at an even steeper angle. In monoplane or biplane configuration, the Fly Baby does meet the US rules for Sport Pilot. In the United States, you do not need an FAA medical to fly a Fly Baby. With the plans off the market, building a biplane is difficult. However, you might be able to buy a used set of plans. In any case, my advice is to build a monoplane first, to have something to fly, and build the biplane wings in your spare time after the first flight. The biplane wings take longer to build, since there are four panels and a center section, and they're swept rather than straight. If you build the monoplane wings first, you'll have something to fly while building the extra wings. add 30% safety factor = 1700 feet 516 metres recommended landing distance. Bowers recommends Continentals between 65 and 85 horsepower. The biggest engine I've heard of is a Lycoming O-290 (~125 HP). The 'Baby isn't a fast airplane by any stretch of the imagination, so bigger engines don't really buy you much. You're better off with the lighter weight (and lower fuel burn) of the little Continentals. On the subject of the Continentals, both 'Babies I've flown have been powered by the C-85. I've formated on A-65 powered versions. The performance difference was marked, especially considering I was heavier than the pilots flying the 65 HP versions. Tom Staples has replaced his A-65 with a C-85, and his daughter reports that his cruise went from 80 to 95 MPH and his rate of climb from 500 to 1000 FPM! There's no reason at all you couldn't fly a Fly Baby on a Rotax 532 or 582. These engines are considerably lighter than the Continentals, though, so you'll need a longer engine mount for CG. Might look a bit goofy. These two engines are only 65 HP, though. Volkswagens are too anemic. Draggy airplanes need large propellers, and your typical VW ends up with a little 42" toothpick to be able to turn the 3400 RPM where it produces 65 HP. VW-powered 'Babies have flown, but the owners soon convert them to Continentals. An Rotax 912 (four cylinder four stroke) would be ideal, if you've got the $$$$$ to buy one. Personally, I'm somewhat taken by some of the smaller auto-engine conversions. I've met the designer of the Stratus Subaru conversion a number of times, and think the engine has excellent possibilities as a Fly Baby powerplant. An examination of Fly Baby engine options can be found on the Engines page. Here's a list of suppliers that carry Fly Baby-specific sort of parts. This doesn't constitute an endorsement; this isn't an "approved" list. But they might be good starting point. The customer must make his or her own decision as to the airworthiness and value of the items mentioned. Those who like to get an idea of the total order size required can check out this attempt at a representative materials list. It's in Microsoft Excel format. Several Fly Baby builders have been working with Ray Landis (president and also a pilot) of Advanced Manufacturing Systems (Decatur, AL) to fabricate new Fly Baby metal parts. Folks report excellent workmanship and fast response. Contact Ray at 256-350-8386. Andrew Budek-Schmeisser is now selling welded Fly Baby components, from a single piece to a full-blown set. Aircraft Spruce and Specialty sells practically all the individual components, and Materials Kits to provide all the raw materials. Wicks Aircraft is a well-liked supplier of a wide variety of homebuilding materials. They also have Materials Kits. B&D Plywood, in Tacoma, Washington is a good source for plywood. Boulter Plywood is located near Boston, and is recommended by one of our New England builders. McCormick Lumber and Cabinetry is in Madison, WI. They carry Sitka Spruce. Probably the best source of Fly Baby goodies are unfinished projects and Fly Markets. There are still a number of unfinished projects out there...I once called on one that was essentially complete, less engine. The owner wanted only $1,000 for it. Steve Pitts took the old Bulletins and converted them to Adobe Acrobat format (.PDF). You can now download them for free. Also, I've still got a few hard copies left, if you would prefer. I'm selling these for $20, US Postage paid. Email me for ordering information. One of the main reasons the Fly Baby was so popular in the 1960s is its low-cost construction. Back then, aircraft-quality wood was still in wide production, and huge stocks of aircraft hardware (like turnbuckles) had been produced during the war and were still being sold at low prices. Unfortunately, in the 45 years since, things have changed. It used to be that wood was cheap but alumimum was expensive; that's no longer the case. The surplus turnbuckles are long gone, and the new production stuff is quite a bit costlier. "I got my Aircraft Spruce and Specialty catalogue recently and spent some time pricing FB construction. I started with the materials list from Ron's site and plugged in prices from AS&S, using the lowest prices when a choice was necessary (e.g. cad plated vs. stainless bolts). "The total was about $8,125. "Of course, that doesn't include engine, fuel tank/lines, prop, instruments, covering, paint or even glue. It's just the airframe and fittings. Of course, a good scrounge/bargan hunter can do it for less, but I think that's a good benchmark, just in case somebody asks." Since the Fly Baby is plans-built (e.g., no complete kit) the cost of construction varies from builder to builder. Some folks opt for all new hardware, some haunt the Fly Markets for good deals. As Dirk says, his pricing assumes new parts (albeit the lowest-cost new parts) exclusively. If you scrounge, or buy partially-completed aircraft, you can do a lot better. The price can go higher, too.. If you decide to add stuff like an electrical system, radios, and a transponder, you'll add quite a bit to the cost of the airframe. As far as engines go, check Trade-A-Plane for prices. A good C-85 will probably run ~$3,000-$4,000. A run-out will go for quite a bit less, and you can overhaul it yourself. A wood prop will run $600 or so. Fly Babies are very cheap to run. My C-85 burns ~5 gallons an hour of $3.00/gallon car gas. That's $15 an hour, plus a bit more for oil. Hangar costs vary widely, but you can probably get your Fly Baby under cover for ~$200 or less per month. Don't tie the plane outside for long periods--it isn't good for it. Liability insurance (only) costs about $200/year. Bruce Olson's Fly Baby Blog. Bruce is rebuilding an older Fly Baby. Billy Beck is documenting Fly Baby construction. JP's Fly Baby Progress. John Paul is an Australian, and his web page has tons of construction photos. Dave Munday was working on a tandem Fly Baby of his own design a while back. His page includes drawings and technical information. While Robert S. Hoover wasn't building a Fly Baby, he was a champion of those who want to build low-cost wooden airplanes. He'd written numerous articles on the subject. While he passed away in 2010, his blog is still up, and you can find his downloadable drawings and instructions on the Chuggers Group on Yahoo. Fly Baby ++. 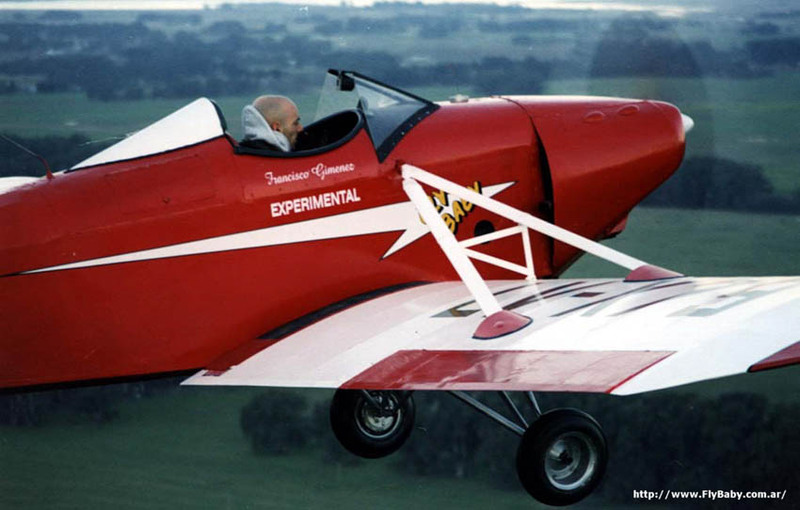 Frank Stutzman's thoughts on a tandem Fly Baby concept plane. William David is building Crowbird, a two-seater inspired by the Fly Baby. Hevle Aviation two-seater. It's available in both plans and kit form. The Warner Revolution is a single or two-seat homebuilt quite similar to the Fly Baby, but is available in a full kit. The Buckeye Pietenpol Association runs a page for this "grand old dame" of homebuilding. The Piet is a parasol-winged two-seater dating back to the 1930s. Fly Baby Email List . Hosted by Yahoo, the email list can be used to ask questions of your fellow builders. You can sign up for the email service without signing up for Yahoo by email . However, viewing the posted photos requires signing up for Yahoo. The Fly Baby Facebook (FB^2) is pretty active, with pictures regularly being posted. For overall categories of information on these pages, go back to the top of this page. This index provides a bit of cross-referencing, where a given topic might be discussed in several places. Installing BNC connectors on antenna cables. A strut-braced Fly Baby, courtesy of Miguel Tschopp's web page. This airplane was built in Argentina, and Miguel's web page includes the official drawings needed for approval by the local FAA-equivalent. Every year, I generate a calendar that features Fly Baby pictures. A Skosh More Room. A simple modification that gives you another inch of legroom. Modifying the cockpit coaming for more room. Chuck Davis' report of his first flight in the Fly Baby he bought. Fly Baby Bulletin downloads. Pilot reports, builder reports, etc. from the 1960s. Tailpost Problems and their Correction. A discussion on split axles. Drew Fidoe on care and feeding of Maule SFSA tailwheels. What Size Tires for a Fly Baby? Getting the WWII Army Air Force markings right. Slightly Weird Pictures. Like "Altered States", but not edited. Pilot Operations Handbook (POH). That's a Word version so you can edit it and insert your own values. Here's a PDF for those who just want to look at it. Drew Fidoe on the care and feeding of the Maule Tailwheel. PDF File. Plexiglas or Lexan? One-Piece or Three-Piece? This photo is Rocky Phoenix' airplane, taken by Roy Zilko at the Hood River Fly-In in 2018. That's Mount Hood in the background. Still primarily working on the PB100 material. It's complete through Article 8, and there probably won't been the need for more than one or two additional articles. One big addition with this update: The Fly Baby Memes! The title photo on this page is Lew Mason's own watercolor painting of his "Boche Baby" over San Geronimo Airpark. This painting shows N118LM without its rear gunner, which mounts to the surface and is quickly removed and re-installed. Otherwise, there isn't much updated on the main page. I've been spending my time on the PB100 project...over the past six months, I've written six "Companion Guides" to go with the original construction articles in EAA Sport Aviation magazine. That's over 300 pages more material! That's 50% more than the plans themselves, and I'm not done yet. It's the 100th anniversary of the birth of Pete Bowers! We're celebrating by developing a new way to build the airplane, using the EAA SPORT AVIATION magazine articles as the core. See the PB100 Web Page! I have been directed to cease selling Fly Baby plans.